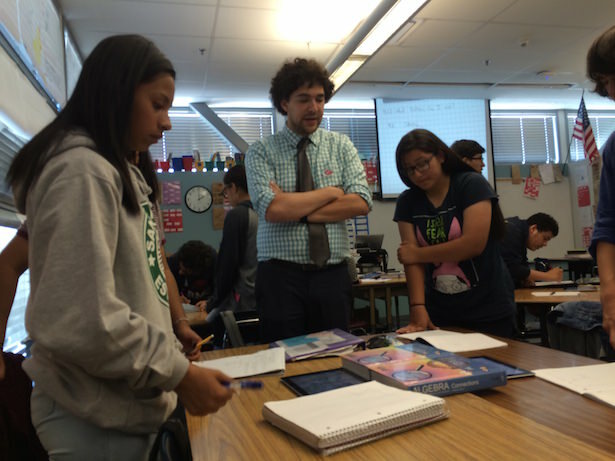 Luther Burbank Middle School teacher Benjamin Feinberg in the last week of class this June. There were three days left in the school year, and final grades had already been turned in. Benjamin Feinberg’s 8th grade algebra students at Luther Burbank Middle School in Highland Park were looking forward to graduation and officially becoming high schoolers. But despite these kids having no tangible reason to stay engaged in the lesson plan and work hard, there they were on a June afternoon, each with laser-like focus as Feinberg worked his way through the day’s 84-minute class, the students learning simply for learning’s sake. Feinberg’s secret to hooking kids’ interest? Real world data. And not just real-world, but their-world data. Feinberg is fascinated with data, particularly about LA Unified. When a new set of accountability measurements came out in February, he dove in, crunching the numbers and even coming up with his own metric. That fascination he then brought into the classroom and found that kids were surprisingly interested in dense data about the school district. “Math lives all around us, so if we want to teach our students to be lifelong mathematicians, we have to emphasize that every aspect of our life can be analyzed mathematically and be part of the decision-making process,” said Feinberg, who teaches magnet students from Luther Burbank’s Math-Science-Technology Magnet and its Police Academy Magnet. Feinberg also launched a data blog, schooldatanerd.com, in February where he started by analyzing the new school accountability system developed by the California Office to Reform Education (CORE). He said he was inspired after reading’s LA School Report’s own analysis of the CORE data. The six California school districts in CORE, including LA Unified, chose not to do any public analysis beyond a school’s individual score, and the system will likely not be used again because the state is currently developing its own accountability system that will be required under the federal Every Student Succeeds Act. “At first (the blog) was just for students as a teaching tool, but now it has become more of a hobby for my adult friends to also read,” said Feinberg, who is from from Mar Vista, attended a magnet program at Venice High, earned his undergraduate degree from UC Berkeley and his Master of Arts in Education from Loyola Marymount University. He was nominated by his principal last fall for the California League of Schools Teacher of the Year award. Using real-world data is a cornerstone of Feinberg’s teaching style as he strives to move math beyond just numbers and equations on the board. His lesson that June afternoon included a problem about the angle of the Leaning Tower of Pisa and a blog post he wrote about the college acceptance rates of LA Unified’s high schools. Students’ projects read more like social studies treatises than math class papers. Feinberg helps direct them to data sets about problems or situations close to home, such as the drought or ocean pollution. Using that data, they form their own conclusions and solutions. Feinberg’s students said they appreciated the real-world aspect of his math teaching. “I realized when he let us search our own high schools that Venice didn’t have that many kids apply to UC schools, and only half of those kids got in, so it was kind of depressing,” said student Sophia Maldonado, who will be attending Venice High School. Student Marissa Lepe said the use of data has helped her excel in the class. When Feinberg started showing students some of his data conclusions on CORE, he said they became engaged in the material. Feinberg’s blog has taken several different looks at the CORE data and made a number of conclusions, such as that the district’s high schools scored better than elementary schools, which was the reverse of what had occurred with the state’s previous accountability system, the Academic Performance Index (API). Feinberg also examined how schools did by race, subgroups and socio-economic status. After concluding that the top CORE schools are whiter, wealthier and have fewer English learners than most of LA Unified, he decided to try a different angle in figuring out the top schools and used regression software to calculate a prediction for a school’s score based on its racial, economic and subgroup factors. By using this method, schools can be compared to other schools with similar demographics and how they were predicted to score. Schools can score high on his “FO’REAL score” (which stands for Fair and Obvious Residual Evaluation of Academics and Learning) even if they didn’t score high on the overall rankings. “The difference between what the school scored and what the FO’REAL model predicted tells you a lot about how they did compared to schools of similar attributes,” Feinberg said. Feinberg said his students were particularly interested in the FO’REAL scores. “They liked those because it made our school look good. They thought it was interesting and really wanted to look up their own neighborhood school’s score, and looking at how it impacts them, and that’s often the goal of math — to show students how this impacts them, and I think it achieved that goal,” he said. Some of Feinberg’s data crunching makes the district look good, some does not, but he said he has not gotten any negative feedback from other teachers or district superiors over his blog. Training opportunities have been key to Feinberg’s own development and that of his teaching style. Some of the techniques he learned through professional training to keep his students focused include rhythmical clapping to get their attention; the students repeat the clap back. Every fifteen minutes or so, the students are asked to get up and wander around the room to find a parter or a group and work on a question. Feinberg said he wasn’t always adept at keeping control of a classroom. His first teaching assignment was at Johnnie L. Cochran Middle School while working for Teach for America. Before his two-year TFA stint, the second which was spent at Aspire Public Schools after being laid off from Cochran, he received five weeks of training. “When I was at my first school I was a total mess. It was Teach For America and I was thrown in. Five weeks is not enough time to prepare a teacher. I sort of listened to everyone around me and made every mistake possible,” Feinberg said. Feinberg, who has been teaching for eight years, said he follows a hybrid of several professional development courses he has taken since his Teach for America job. Before coming to Luther Burbank he worked his Teach for America job for one year at Johnnie L. Cochran and a few years at Aspire Public Schools, where he learned new techniques through professional development courses that followed the teachings of Lee Canter and Doug Lemov. At Luther Burbank he was sent to a development course led by Kagan, and he now blends all of these techniques into his own. Updated to reflect Feinberg’s first year of Teach for America was at Johnnie L. Cochran Middle School and that he received his undergraduate degree from UC Berkeley.